If you like mischievous monkeys then you should definitely spin the reels of the brand new Go Bananas slot. Royal Panda has just added this monkey-themed video slot to its exciting online gambling repertoire. 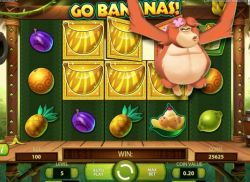 A spokesperson for the online casino noted that Go Bananas has all the ingredients for another successful Net Entertainment title. The 5-reel video slot treats players to five unique wild symbols: wild gorilla, wild orangutan, wild baboon, wild langur and wild tarsier. They transform both themselves and a pre-set pattern of nearby reels into wilds. Just like in most other online slot games, wild symbols replace symbols to achieve the highest win. Go Bananas features 20 pay-lines, and takes you to a tropical jungle loaded with jolly apes, tastefully fruits, and sparkling gems. The mischievous monkeys appear on the screen every time you win, which adds to the jovial character of this slot. It’s an understatement to say that Go Bananas is a vibrant and lively slot title. In addition to the monkey-themed game, Royal Panda launched a new slots series, including So Much Sushi, So Much Candy and So Many Monsters. All of them feature 5 reels, 25 pay-lines, in addition to a generous free spins feature. The triple treat has something fresh to suit every taste, adding a fun twist to Royal Panda’s online casino catalogue.